War changes people. When push comes to shove and sacrifices have to be made, a person's true character emerges. Gambit made it clear that Morry's greatest desire is for status. Not fully understanding her background, it would be easy to assume that her selfish ways make her more of an opponent than a mother. And in Mimic, she's still working things to her advantage. The icy layer around her heart has yet to be thawed. Not much is known about Joshua in Gambit. As a guardian, he is a complete mystery to all who become entangled in his seemingly magical web of protection. Mimic reveals a bit more, but he is still very much steeped in shadow, his probablity vision playing a bigger role than his character. Gambit threw a glaring spotlight on Reece's raw brutality. The rising conflict between his drive to succeed and his own desires nearly destroyed what he was trying to build. 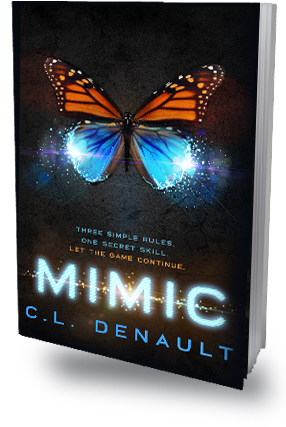 He shines softer in Mimic, stepping into the role of Willow's friend, confidant, and beyond. In spite of all he's done, he truly wants what's best for her. Even if she can't see it. Gambit was all about sacrifice. Willow's decision to protect her village came at great cost, shattering her innocence and dreams for the future. Mimic moves her into transformation, into the world of the tiger . . . where intuition, alliances, and quantum physics work together to reveal the truth of her underlying strengths.